The Mountain Goat In-Breed series started out as a spin-off from its Rare Breeds, the tag given to longneck one-off releases kickstarted with an IPA way back when they ditched the old core range for just Hightail and Steam Ale; so way back, in fact, it predates little ol' Crafty. 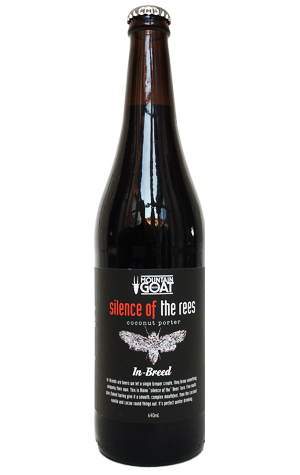 In-Breeds joined Cross Breeds – collaborations with others – and was used to denote beers brewed by individual members of the Goat team, be they brewers or other members of the staff. This one, Silence of the Rees, comes from the mind of Alana Rees, the brewery's "Innovation Brewer" and forklift demon, who's already lent her name to the Alana Banana hefeweizen and was chief brain behind the AIBA 2017 Champion Pulped Fiction. For her latest spin, she's changed tack again, concocting a sweet porter to which have been added lashings of toasted coconut (90kg in each tank), Madagascan Bourbon vanilla beans and cacao. Regular readers will be aware that coconut isn't exactly flavour of the month, or indeed any month, at Crafty Towers yet here, while it's the dominant aroma, the supporting cast of creamy vanilla, chocolate and a hint of roast ensure the coconut is part of a softly, smoothly delivered package. They're claiming it's like a Lamington in a glass and, while it stops short of full cakey-ness levels, it's definitely one who prefer their winter drops at the sweeter end of the scale.